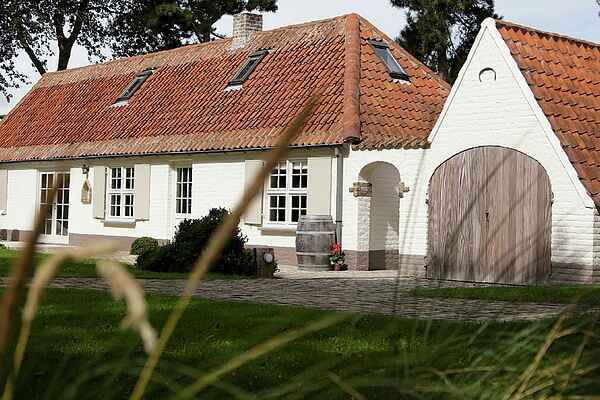 Adjoining the Koksijde dune preserve, this fabulous fermette is situated at the end of a drive in a perfectly maintained green zone, enclosed by chestnut fencing and planted with pea vine. You will feel a sense of complete tranquillity wash over you as you drive up. The property is protected by an electric gate, ensuring plenty of privacy. The interior of the holiday house is designed in a country style with cosmopolitan accents. A harmonious atmosphere has been created through the use of colours and materials. There are 4 tastefully furnished bedrooms and 2 bathrooms, accommodating 5 adults and 1 child. For even more stress relief you can use the infrared sauna, situated in an outbuilding, and then enjoy a refreshing shower under the stars. The holiday house is situated in a tranquil residential area close to Koksijde beach. This is a long and lovely beach with lots of activities, nice restaurants and beach tents for a wonderful day at the seaside. With its vast nature preserves and renowned setting in the midst of the dunes, Koksijde is also an absolute paradise for anyone who loves hiking and biking.